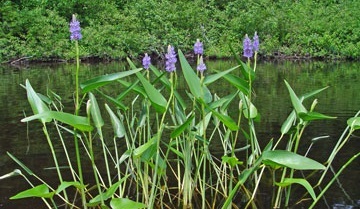 Pickerelweed has heart–shaped leaves with purple or blue flowers. Pickerelweed has leaves that are heart–shaped which easily defines it. The leaves are large and have veins that run parallel. The main stem is light green and grows down underwater into the muddy bottom. Blue or purple flowers grow in clusters at the top of the stems that are 3-4 inches long. The flowers each last only one day. The plant can grow to 3.5 ft tall and each leaf can be up to 7 inches long. Liquid 2,4-D and Dibrox® herbicides both provide good control of Pickerelweed. You can purchase or learn more about these products on our website.